Sublime Text is a cross-platform text and source code editor with a Python API. It is a sophisticated text editor for code, markup and prose. Its functionality is extendable with plugins. Most of the extending packages have free-software licenses and are community-built and maintained. Compatible with many language grammars from Textmate. proprietary software, may be downloaded and evaluated for free, however a license must be purchased for continued use. 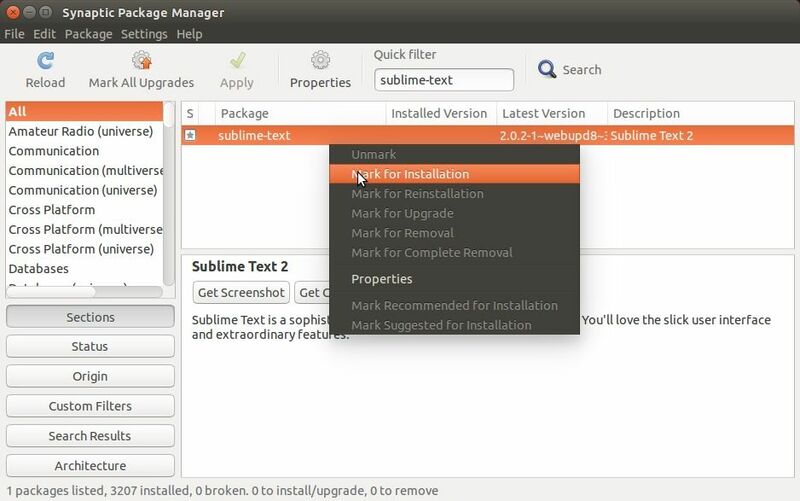 Thanks to Webupd8 Team, an installer script has been made into PPA that automatically downloads Sublime Text 2 from its website and installs it and its launcher, docs on your Ubuntu. Launchpad Synaptic package manager and click Reload button. Search sublime-text in the filter box. right-click on sublime-text and select “mark for installation”. Once installed, launch the editor from the Dash/Menu. Similar to above instructions, run below command instead to add another PPA and finally install the editor via Synaptic package manager. 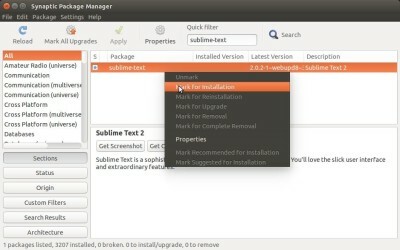 NOTE: you can only install one version of Sublime Text in your Ubuntu. To install version 3, you may first remove version 2 from Synaptic package manager. Thank you it just worked fine here!